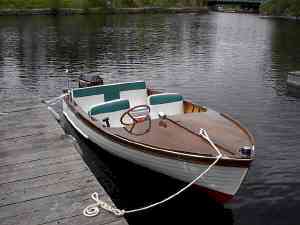 Here is our current inventory of fine antique and classic wood boats. If we don't have what you want, we may be able to find a boat that suits your needs. We also have additional outboard boats, as well as project boats available. Please contact Marine Museum Sales and Brokerage at mmmuseum@vianet.ca for further information on any of our listings, or to discuss how we can help you sell your boat. We charge a seller's commission of ten percent. All commissions earned go to the Museum’s Acquisitions and Restoration Fund. Our finest offerings are often co-brokered with the large U.S brokerage firms to give the boats worldwide exposure. 1955 24' Shepherd Twin Runabout. One of the great ones. Recently re-powered with twin Marine Power 4.3 V6s at 235 HP each; new ZF drives; new instrumentation; low hours. Custom-built trailer available. Easy to inspect in her Muskoka boathouse. Excellent value at $77,000. A great blue water boat. Needs some attention but is complete with 6 cyl. Chrysler Crown engine and good trailer. Great potential $10,900. Offers. 4 cycl. Universal. 2008 survey indicates boat to be in very good condition/restored. On a 1985 Thompson Shorelander single axle trailer. Comes complete with all required safety gear-life jackets, mooring lines, fenders, anchor & rode. Has electric bilge pump, new battery, bilge blower. Asking $9500 incl. trailer. Inquire through Muskoka. Marine Museum. 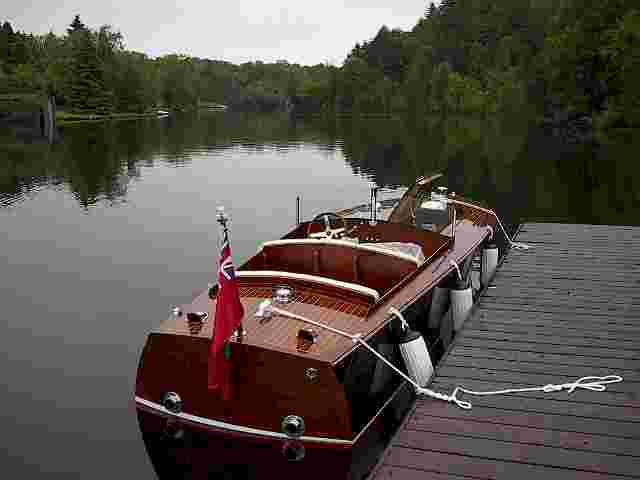 1957 23' Chris Craft Continental. 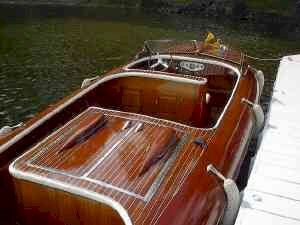 1938 19' Chris Craft custom Runabout. Fully-rebuilt (original) Hercules KA six. Fresh varnish all around. Tandem trailer. No issues. Excellent condition and very, very rare. Owner moving up. Priced to sell. US$39,900 firm. Mahogany Ply, V-Drive 6 cyl. $7,000. 120 HP I/O rebuilt. 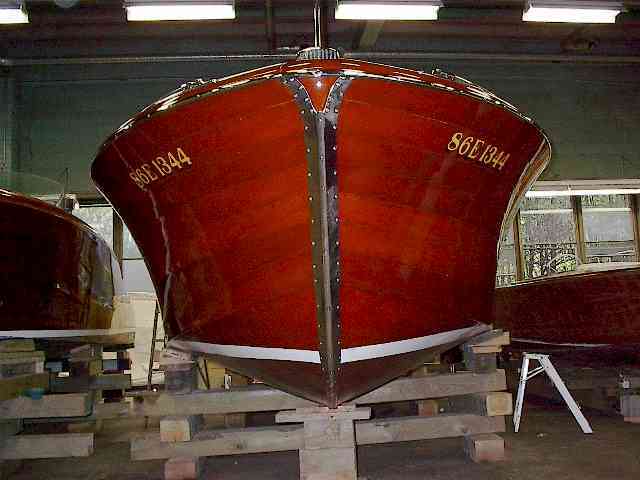 Traditional black hullsides. Custom tandem trailer. Excellent condition throughout. $14,900. 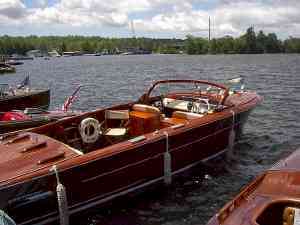 1964 16' Giesler French River. 1956 16' Shepherd SKI-BEE O/B. 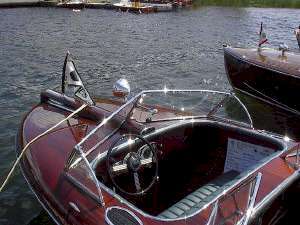 Pristine one-owner boat, all original, boathouse kept, Complete with ''80s 70 hp OMC. Ready to go for 2006 $7,500. Rare boat. Fresh varnish and bottom paint. Late 1980's 30 HP Yamaha with recent full service. Trailer. Beautiful condition. $5,900. Offers. 1930's 14' Ackroyd Sail Boat. Spectacular collector's boat. Rebuilt Evinrude 15 HP. New canvas and cushions. Very rare in this condition. $8,900. Great second boat and perfect for younger boaters. 1999 15 HP 4-cycle Merc; fresh varnish; new cushions 2001; trailer. Recent survey and in very good overall condition. $4,900.